Hundreds of Delicious Games, Activities, and Doodle Fun to Take to the Table! Dimensions: 12-1/2 x 10 in. Set includes 40 place mats, 24 plate activity sheets, and three 2-color crayons packed in clear vinyl case. 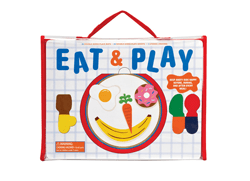 Little ones will devour the fun served up in this totable set of 40 place mats, 24 plate sheets, and fork, knife, and spoon crayons. At a restaurant or at the kitchen table, kids will have a blast playing games, drawing their favorite foods, and writing notes to the chef.